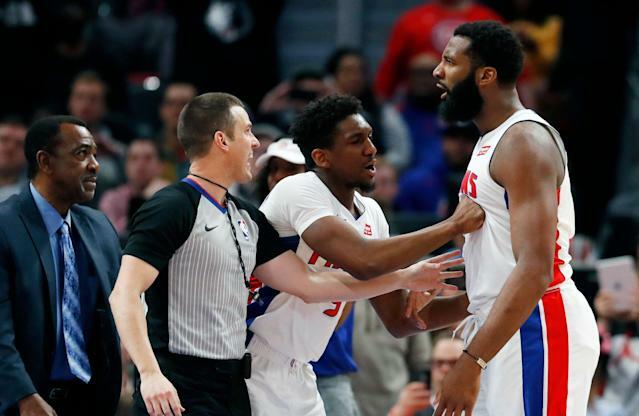 Minnesota Timberwolves forward Taj Gibson had an early exit from Little Caesars Arena on Wednesday night after he got into it with Detroit Pistons center Andre Drummond. Gibson, while attempting to box Drummond out under the basket with just more than 10 minutes left in the fourth quarter, threw an elbow into Drummond’s throat and sent him flying to the floor. The shot went in, but whistles sounded instantly as Gibson threw his hands up into the air. Drummond, naturally, was extremely heated and hopped right back up. Both players had to be held back and separated while officials reviewed the play. Gibson was eventually assessed a flagrant two foul and ejected from the game. Timberwolves interim coach Ryan Saunders picked up a technical foul, too, after voicing his displeasure with the officials. Drummond, who led the Pistons with 31 points and 15 rebounds while shooting 11-of-18 from the field, didn’t hold much of a grudge after the win. The Pistons drilled both free throws from the technical fouls, and then Thon Maker hit a 3-point bucket on the next possession — marking a seven-point possession to push them to a 16-point lead. From there it was smooth sailing, as the Pistons mounted a 25-point lead in the fourth quarter en route to the 131-114 win — their seventh in nine games. Luke Kennard dropped 21 points off the bench for the Pistons, and Ish Smith finished with 19 points, shooting 8-of-10 from the field. As a team, the Pistons had 70 total points come off the bench, compared to just 43 from Minnesota. "Our guys that came off the bench did an excellent job tonight," Drummond told the Detroit Free Press. "They picked up the slack when we started off slow. They came in and played excellent. Those guys play like that each and every night."